There are several hiking trails from the parking lot at the end of Fish Creek Falls Road ($5 a day parking fee, at this writing, for an all day vehicle pass). One trail is an easy 1/4 mile (400m) and ends at a viewing station where the entirety of the falls can be seen. Another trail goes straight down into the U shaped valley that was formed by glaciers during the Ice Age. Click on to enlarge to see the trail map. Along the scenic overlook trail there were many interesting placards to read. Click on the photo collage above to enlarge it to see the info on the other placards. They give information about the importance of water to the ecological balance of Colorado and its wildlife and trees. Snow melt makes up the bulk of water in our state, and that water also feeds into many other states water supplies. The average US household uses over 600 gallons of water a day! Conserving water is important everywhere, as our population grows worldwide. 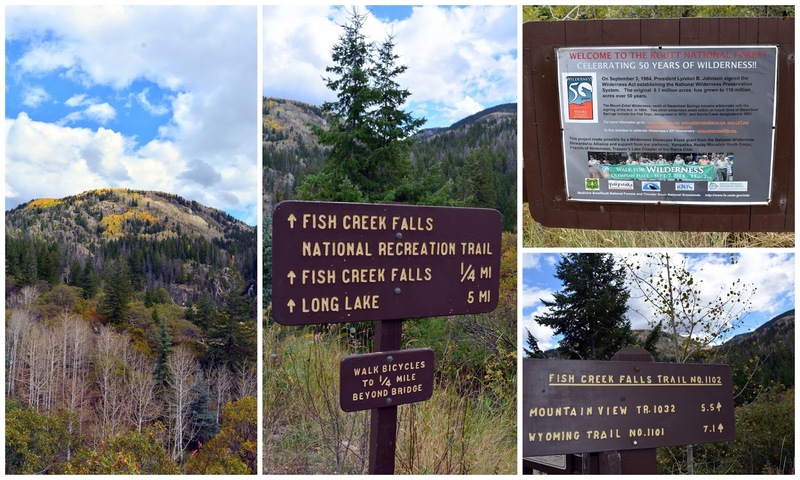 The Fish Creek drainage is one of the highest producers of water in the state of Colorado. Our first view of the Fish Creek Falls! 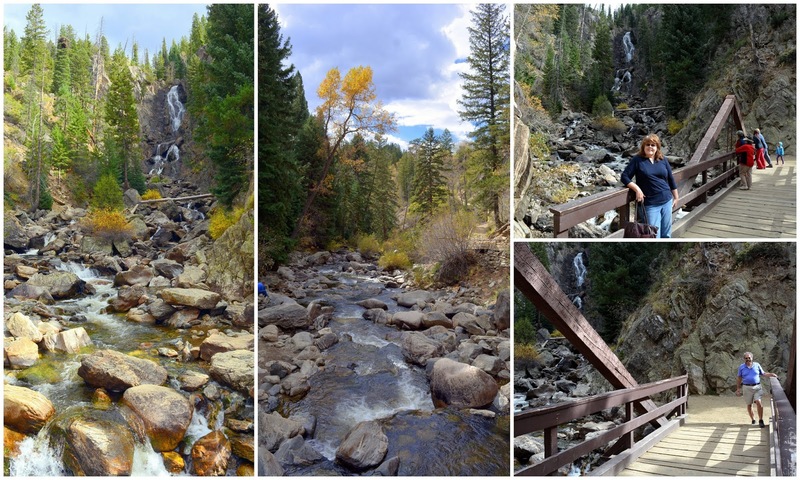 We visited in early October, so the stream of water going over was not as great as it would have been with the spring snow melt time, as the Steamboat area receives over 300 inches of snow throughout the winter. It also increases flow after a summer afternoon thunderstorm. Even though they were not at peak flow, the falls were still impressive! Can you see the man at the upper left corner of the falls? He is taking their photo from a precarious ledge near the falls. This perspective shows the height and size of the falls. He sat by the falls for some time and I was very relieved when he climbed back on top to safety. I would not recommend anyone doing this. I'm sure it is not allowed and that it can be very dangerous! If you'd like to listen to the sound the upper Fish Creek Falls made please click on this direct link to a short video I made on my Mille Fiori Favoriti facebook page. .... and the lowest section roaring over the large boulders on the bottom. People were also exploring the bottom of the falls. I don't think the water is very deep, but I'm sure those boulders could be slippery! 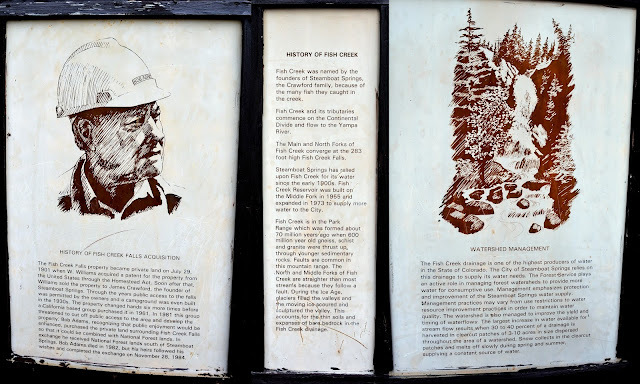 My husband and I did a loop trail that lead to the bottom of the falls and along the way we saw a placard that described the history of the falls and their importance to Steamboat and many other watersheds. Please click on the collage to read this info. 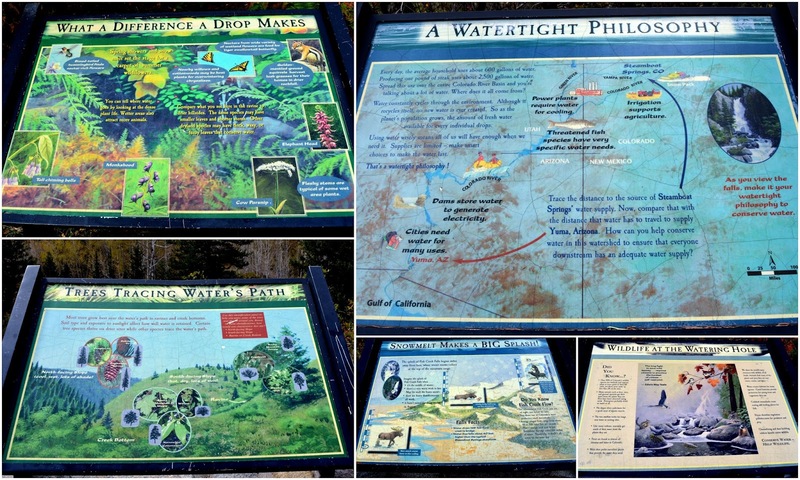 The trails along Fish Creek reflect the Riparian zone and are full of lush foliage--ferns, shrubs, berries, scrub oak, pine and aspen trees. 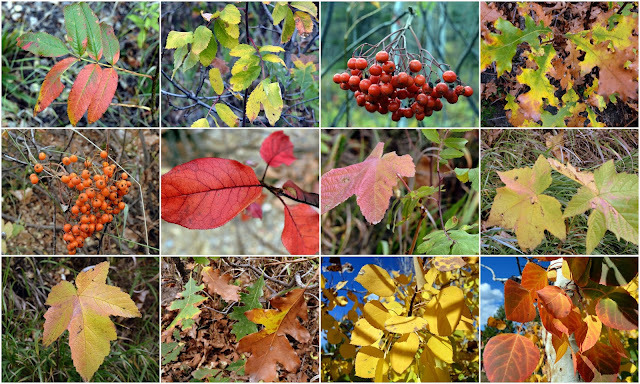 ...as you can see by this photo mosaic! It was almost the end of autumn in NW Colorado, and soon snow would be falling, making the Steamboat Springs ski areas come alive! 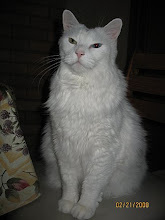 Back home in our area, SW of Denver, we've already had snow a few times! It doesn't last on the ground very long in our altitude of 6,000 feet. The sun comes out and most of the snow melts quickly, as the day time temperature goes into the 50's and 60's We've also been walking a new trail that was made by our community's trail club near our home. It leads up towards the foothills and gives us a good workout! This is Thanksgiving week in the US, and I know many of my readers will be busy cooking, traveling and celebrating. Enjoy and be safe! 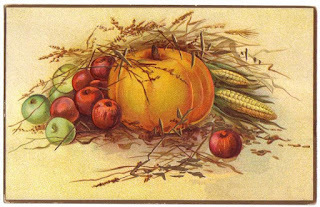 This year, we gather together with our families and friends to give thanks for all our blessings, let us also say a prayer for peace for this turbulent world! The South Cheyenne Canon Road to Seven Falls has been called "The Grandest Mile of Scenery" in Colorado. 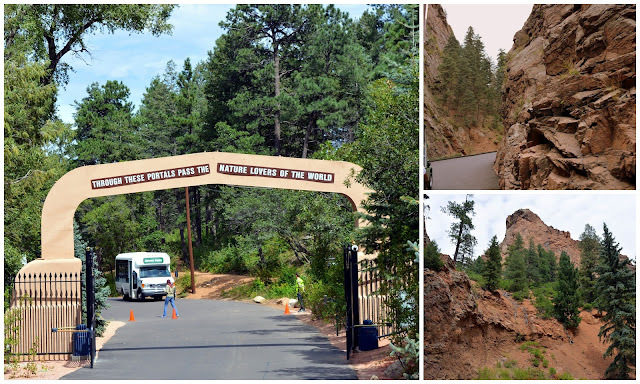 On either side of the picturesque 1,125 foot canyon, we passed through the "Pillars of Hercules," which are only 41 feet wide at their narrowest point and rise 940 feet on the right and 790 feet on the left. ...but instead we opted to take the four story elevator inside the mountain to the Eagles Nest viewing platform. 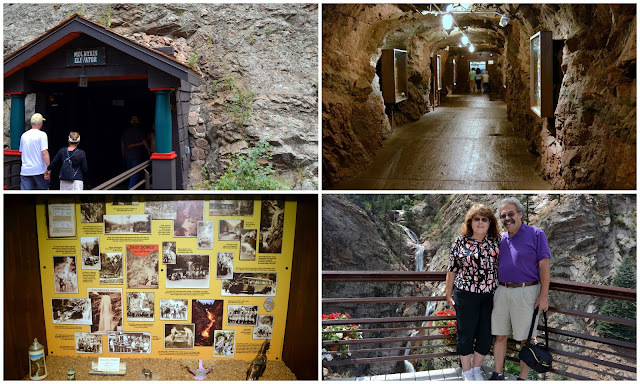 There were placards inside the tunnel leading to the elevator that contained photos and interesting information about the history of the Seven Falls area. 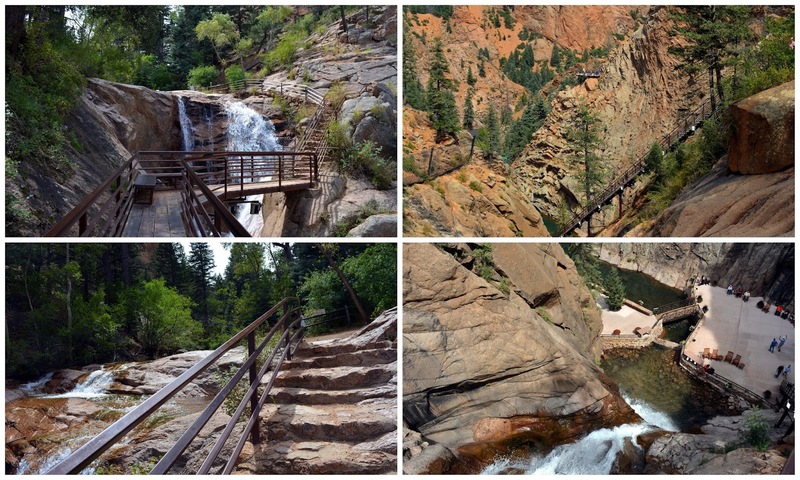 The view of the entire 181 feet length of cascading Seven Falls is best seen from the Eagle's Nest viewing platform. Seven Falls is the only Colorado waterfall included on the National Geographic list of international wonders. After we took the elevator back down to the bottom of the canyon we walked over to the bottom of the falls. Along the way up the stairs we saw the different fall formations/ From bottom to top they are Hill, Weimer, Hull, Shorty, Bridal Veil, Feather and Ramona. The stair climb up is scenic in all directions. At the top of the Canyon there are three hiking trails that one can take to see different sights. They are open certain hours and months--check the Seven Falls website for further information. ....and the other trail leads to Inspiration Point, described above. We did not hike the length of either trail due to time constraints, as we had early dinner reservations, but we did enjoy the beauty of the trail that we hiked partially. 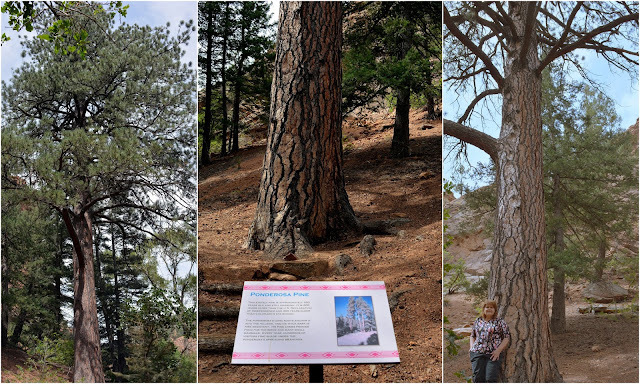 This majestic 450 year old Ponderosa Pine tree captured my attention. You can read more about this tree on the placard above that is situated in front of it. ...and back to the rocking chair area where people waited for those that made the climb, or just wanted to sit and listen to the sound of the falls. The Broadmoor remodeled and enlarged an existing restaurant on the Seven Falls property, which they call Restaurant 1858. It is an approximately 100 seat high end, rustic in appearance, restaurant, meant to evoke the feel of a gold rush era. It may be closed during inclement weather and admission to the Seven Falls area is required to dine there--check the website for further details. The Broadmoor has also installed an area of 10 zip lines they call the Broadmoor Soaring Adventure, that also offer stunning views of the canyon for the adventurous. 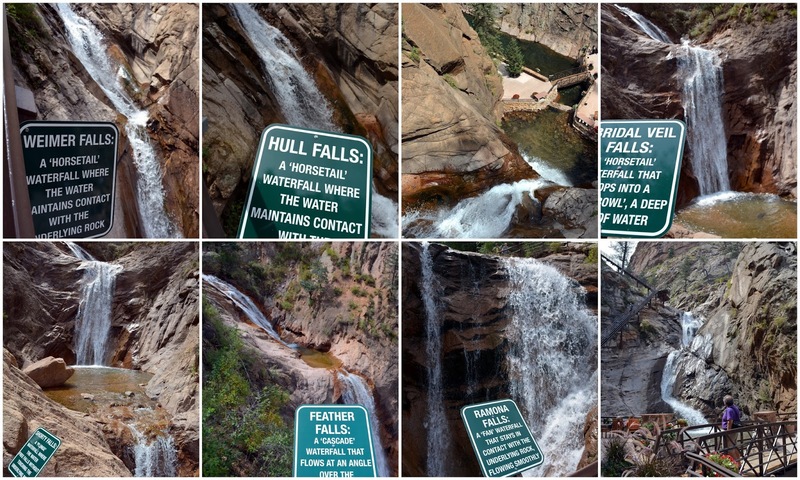 Seven Falls was truly a wonderful sight to see, even in autumn when the amount of water is lower than spring time's snow melt season. 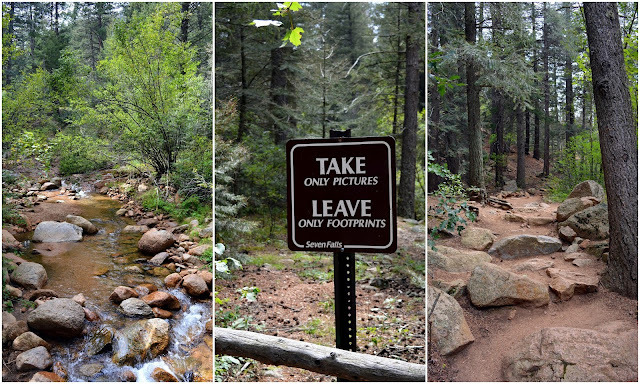 Next time we visit we'll leave more time to explore all the trails on top. It is so exciting to me to be able to enjoy all these beautiful places in Colorado. 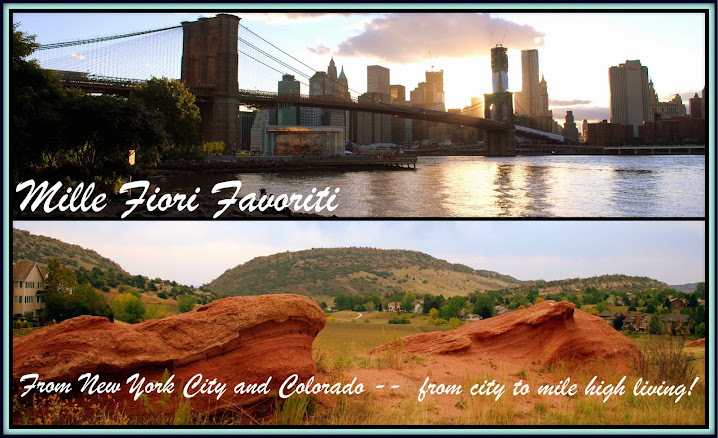 There are many more places I have yet to see in this great state so there is much more to look forward to! 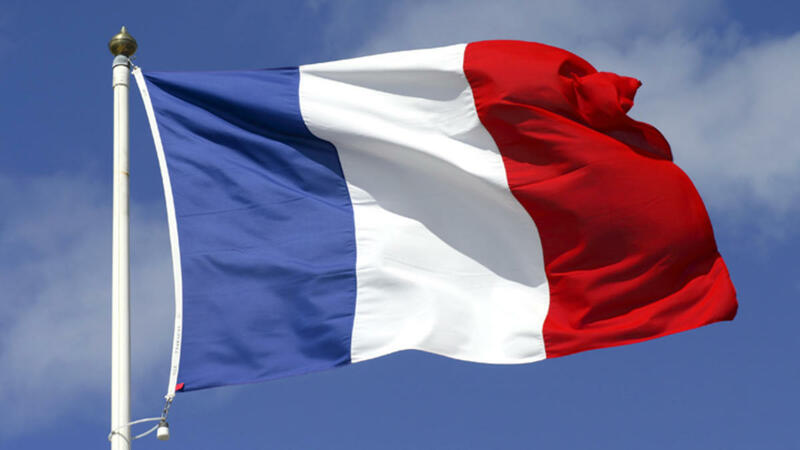 On a sad note, I was so horrified by the recent attacks on Paris and I am keeping all the people of France in my thoughts and prayers. Vive la France! 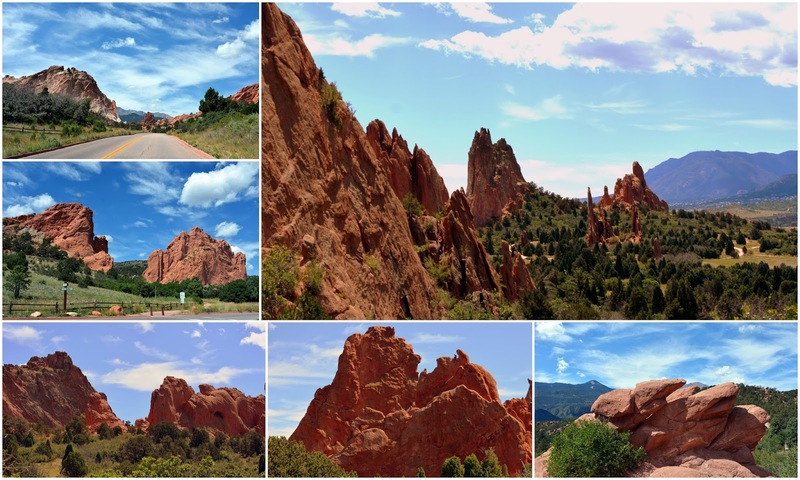 The Garden of the Gods is a registered National Natural Landmark in Colorado Springs, comprised of giant red rock formations that were created during a geological upheaval along a fault line millions of years ago. 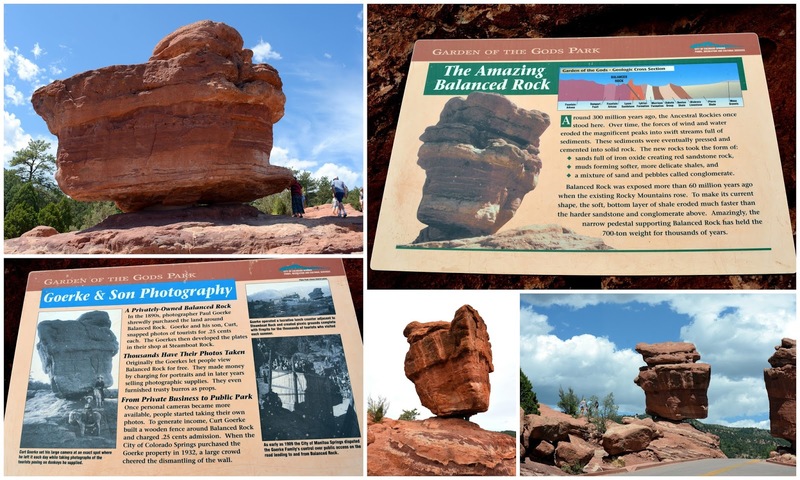 When two surveyors came from Denver City (now Denver), in 1859, to begin the Colorado City (now Colorado Springs) town site they came upon this beautiful area of sandstone formations. M.S.Beach, who related this incident, suggested it would be a "capital place for a beer garden." 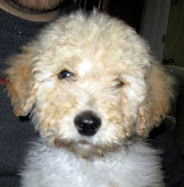 His companion, Rufus Cable, exclaimed, "Beer garden! Why it is a fit place for the Gods to assemble. We will call it the Garden of the Gods." It has been so called ever since. 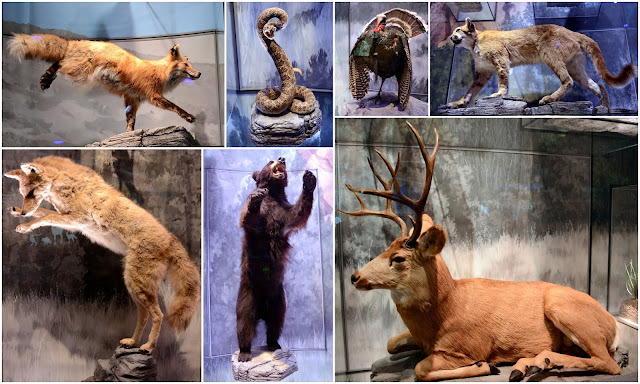 I particularly enjoyed seeing the exhibit of the wildlife that lives in and around the park. 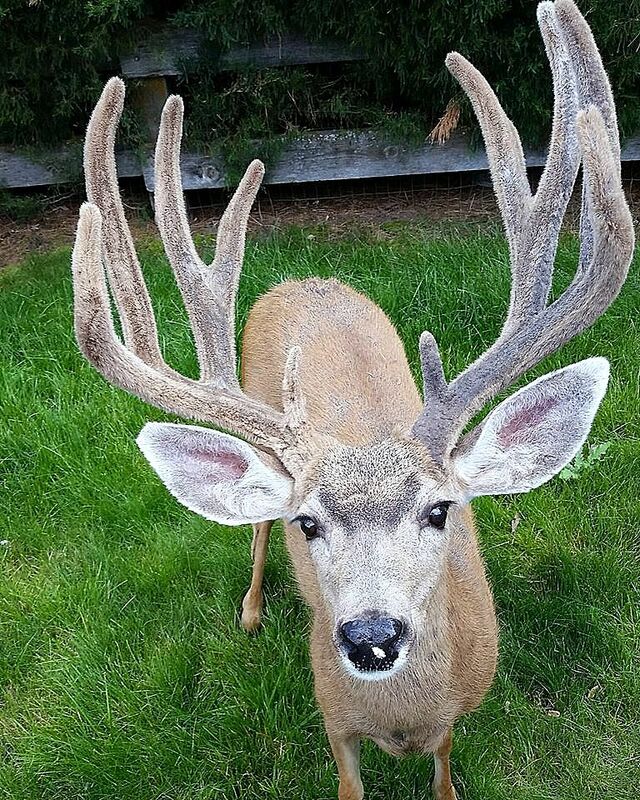 ...so if one is short on time you can drive through the 1,367 acres of the park. The outstanding geologic features of the park are the ancient sedimentary beds of deep red, pink and white sandstone, conglomerates, and limestones that were deposited horizontally, but have now been tilted vertically by the immense mountain building forces caused by the uplift of the Rocky Mountains and Pikes Peak massif. 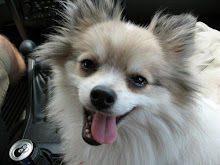 To truly appreciate the park, however, one must park the car and go walking on one of the many trails in the park! The 700 hundred ton Balanced Rock is best viewed this way. Click on to enlarge the collage above to read interesting facts about this formation. There are more than 15 miles of trails in the park, with a 1.5 mile trail, Perkins Central Garden Trail, that runs through the heart of the park that is paved and wheelchair friendly. There were still wildflowers blooming in many areas. White sandstone in the Lyons Formation. The "Three Graces" rock formation. 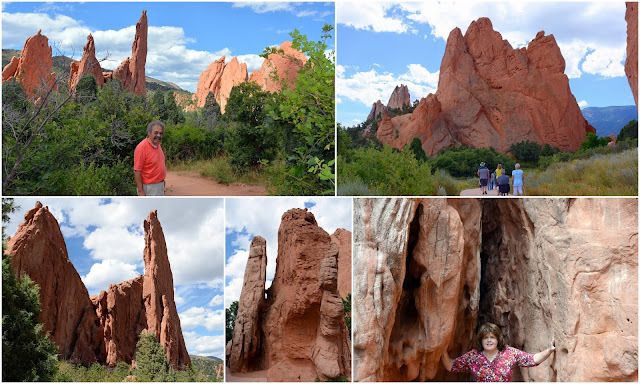 It was fun to see the "Cathedral Spires" and the "Sentinel Spire" rock formation close up and be able to touch something that was millions of years old! 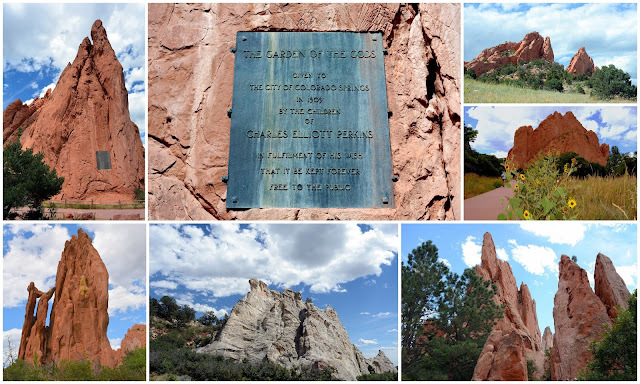 In 1879, Charles Elliott Perkins, a friend of William Jackson Palmer, purchased 480 acres of land that included a portion of the present Garden of the Gods. 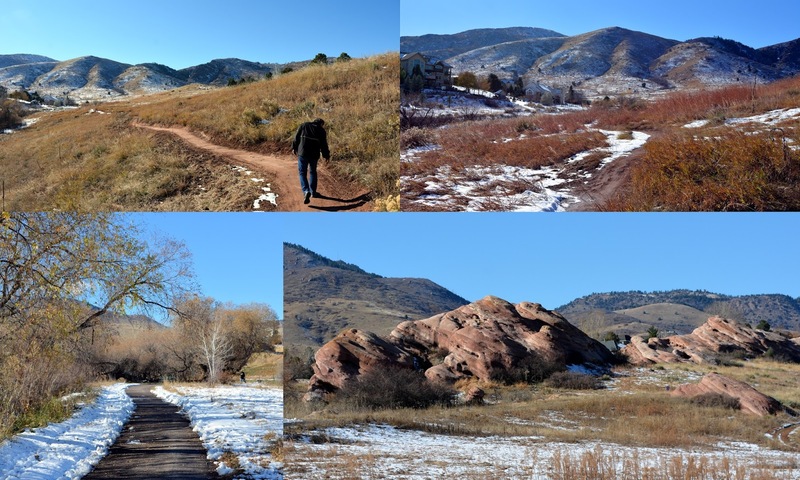 Upon Perkin's death, his family gave the land to the city of Colorado Springs in 1909, with the provision that it would be a free public park. If you click on to enlarge the photo collage above you can see the plaque that has this dedication on one of the rock formations. Palmer also donated land upon his demise, and the city of Colorado Springs purchased more to make the park as large as it is presently. Our last hike of our visit was along the Siamese Twins Trail to see the rock formation with the same name. It's a gentle vertical climb of 150 feet, and well worth the effort. 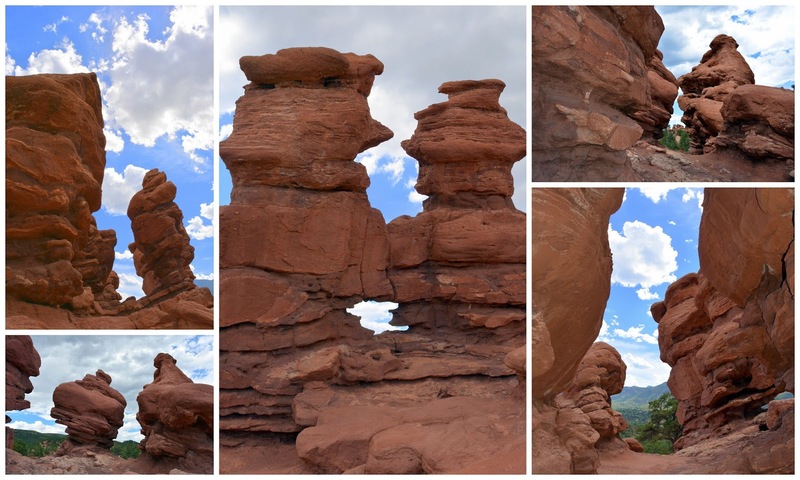 When you get to the top of the trail you are facing the "Siamese Twins" that looks as if they are attached in the middle, as well as many amazing surrounding, giant rock formations. Almost at eye level, right below where the twins are attached, is this natural framed view of another amazing sight---Pikes Peak! My husband and I drove up to the 14,110 foot summit of Pikes Peak, nicknamed "America's Mountain," this past summer--click here to read that post. 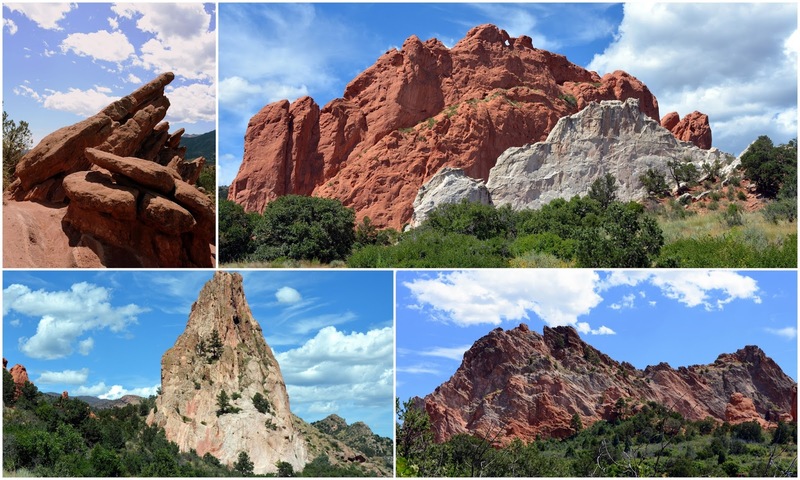 It is easy to see why two million people visit the beautiful and magnificent Garden of the Gods every year. 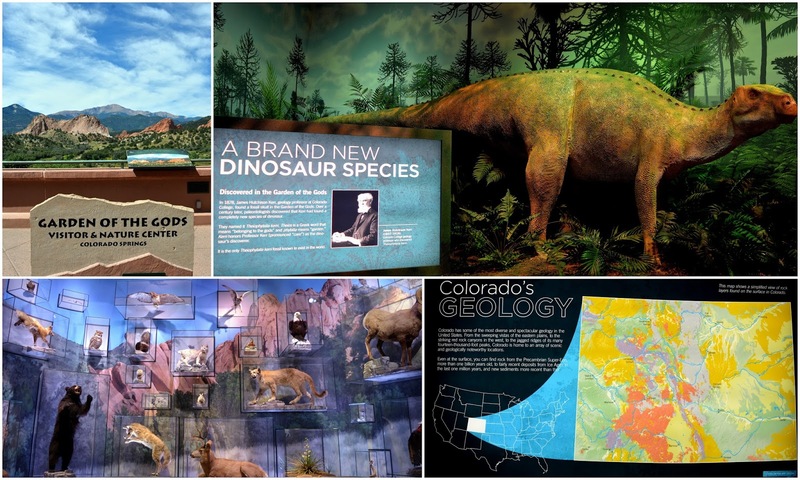 It is one of the most beautiful natural places to see in Colorado!